I still haven't quite figured out what Betty's is, although during my last "photo shoot" in front of the sign I could just make out the sound of billiards from behind this backdoor to the business, so I am going to guess that it is a bar/billiards hall. If so, I should probably pay them a visit, just to patronize the business that allows me to take photos outside their alleyway about once a year. (Truth be told, I am horrible at billiards, but I do like to play!) Anyway, today I am wearing one of my favorite recent prints from J. Crew. The reason why I love this print so much is threefold: first, it's colorful, second, it contains a painterly print, and third, it really could be worn during just about any season. Since it is still pretty hot here in Los Angeles, I paired it with a lightweight blouse, but I can't wait to style it for the winter months with tights and a sweater, perhaps while playing billiards at Betty's? 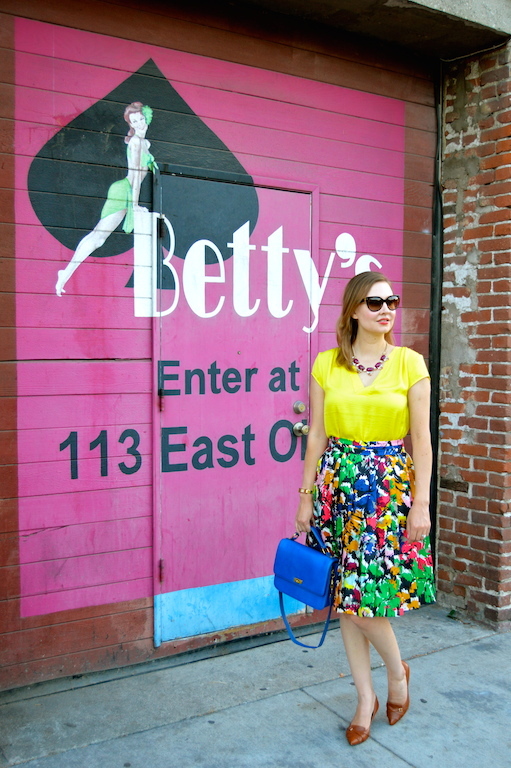 You know how to put a colorful outfit together and look chic! Love it! Fabulous skirt! 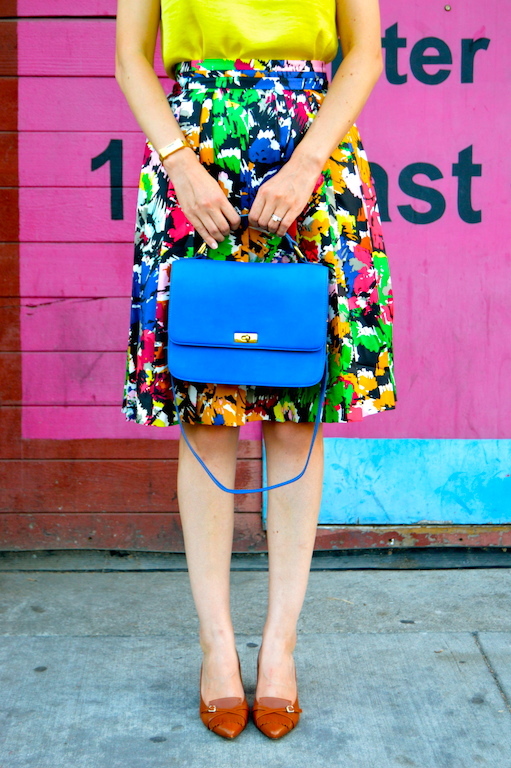 I love it paired with the yellow top and blue bag, but you'll have so fun with so many different color combos! I know I've said it before, but your backdrops are always amazing! Ah gorgeous skirt and yay for figuring out what Betty's may be. You'll have to let us know if you do venture into Betty's! If billiards is the same as pool (or even similar) I'm probably terrible at it :) I love that skirt--the colors are so pretty and work so well with the other colors in your look!